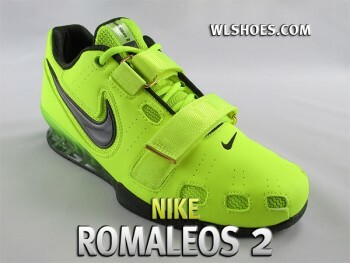 The Nike Romaleos 2 weightlifting shoe is the updated version of the original Romaleo Olympic launched in 2008. I must preface this review with stating that I wasn’t a big fan of the original version of this shoe and found the Adidas model to be a much better choice back then. Four years later, and a new model from both brands, and my feelings are pretty much the same. I found the “refinements” are minimal at best, and given that Nike had four years to improve their design, I’m honestly disappointed in this shoe. Some may say “don’t fix what isn’t broken” but I would argue that the Romaleos did have a few serious flaws and I wish Nike would have corrected these with the newer version. With that said, I will do my best to provide an informative and unbiased review for those of you that are still interested in this model. I definitely cannot find fault with the shoe in the category of build quality; these things are built like a tank. My pair did not have any excessive glue, bad stitching, mis-aligned seams or any other indicators of poor construction. But then again, for an almost $200 pair of kicks, they better be damn-near perfect right out of the box! The upper of the shoe is a synthetic leather material that is commonly used for construction of athletic footwear. The material is fairly thick and has a nice smooth feel to it. 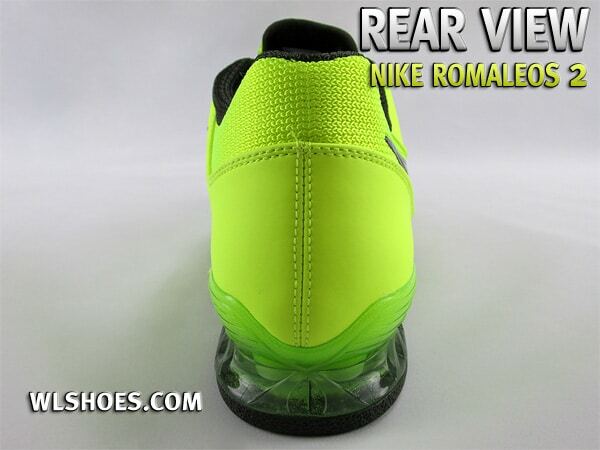 My pair of Romaleos 2 Volt (the neon yellow color) did have a tendency to scuff and stain fairly easy though so if you opt for that color you might want to be careful what you walk in to. The upper features three square breathing vents along each side of the toebox for ventilation as well as a few pinholes radiating across the top and side. I didn’t find these to be too effective for allowing the foot to breath, and in combination with the thick upper material, my foot was doing some serious sweating after an hour of training. If you have foot odor problems you’re going to want to spray these bad boys down after each workout or store them outside. The lacing system and tongue design on the Romaleo2 is pretty straight-forward and what you would expect on an Oly lifting shoe. The loops for the shoe strings are slightly hidden away inside the upper and the tongue has the typical laces loop to help hold the tongue up and in place. The tongue tends to shift to the side some but not enough to be a hindrance. The metatarsal straps across the instep are where I have my first major problem with this shoe. It is the same issue I had with the original version… the straps don’t feel like they are in the right place and they are too long. Although the double strapping system is nice idea: two straps running in opposite directions should allow for a tighter fit. The problem is the excessive length of the straps presents a possible hazard for people with narrower feet in that they could trip over their own shoe straps. Not cool. Not to mention is looks goofy when you have these super long, floppy straps hanging off your lifting shoes. The only immediate remedy I can see to this would be cutting the straps and burning the edges since they are made of a nylon-like material. The other issue is that the straps feel improperly placed; as if the top strap should be higher up on the instep. This is most evident in the heel “slippage” that some have reported they feel at the back of the shoe. This is a result of your foot not being fully locked down high enough on the arch. The sole of the shoe is another area that Nike has supposedly made improvements, with the single biggest complaint about the previous model being the lack of flexibility in the forefoot area. From my observation, the outer is exactly the same with the only difference being Nike added more scoring lines across the forefoot area of the outer. Final result? The forefoot is still one of the stiffest I’ve felt. While lateral stability is crucial, forefoot flexibility shouldn’t be sacrificed in an effort to achieve the former. Now taking a look at the inside of the shoe, the Nike offers two different sock liners (inserts). One is a flat, softer insert measuring approximately 1/4 of an inch and made of a semi-hard foam material – this is the training sock liner. The other is a denser, contoured liner still measuring 1/4 an inch but made of a practically incompressible plastic – this is the “competition” liner. The Romaleo 2 already has a rather high arch support to begin with and I found the competition insert to only exacerbate this… of course I have flat feet. If you have high arches or like a lot of arch support then the competition insert may suit you perfectly. Beyond that I don’t think anyone but the most elite of lifters would feel a difference in stability with one insert over the other; it’s going to be more a personal preference towards fit than anything. The heel and midsole feature the same power bridge design that was used in the previous model. I’m uncertain whether the heel is proportional to the size of the shoe or a set height. Some sites list it as proportional and others state it is a fixed 0.75″ effective. If anyone has any official word from Nike I’m sure we’d all like to hear it. 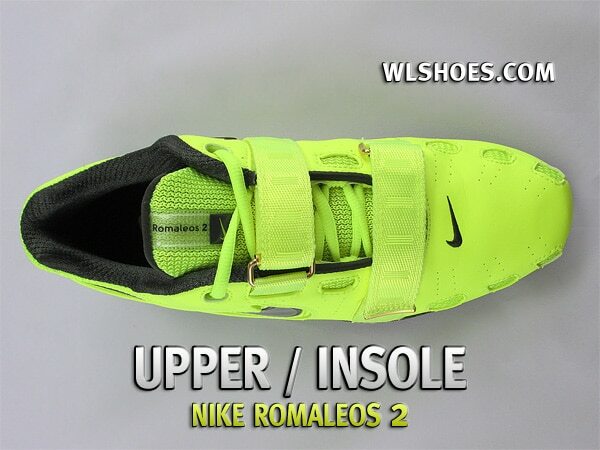 One area in which this shoe wins the “Romaleos vs AdiPower” debate is in styling. I feel the Nike is one of the better looking shoes on the market and the availability of multiple color ways provide a nice set of options to the consumer. At the time of writing these are available in black, red and gold, blue and black and a fluorescent yellow color called volt. If you like for people to stare at you in the gym, the latter color will certainly get you some attention. The overall functionality is what you would expect from footwear in this price range, with the noted drawbacks listed above. The one other thing to note would be the issue of how much this model weighs. 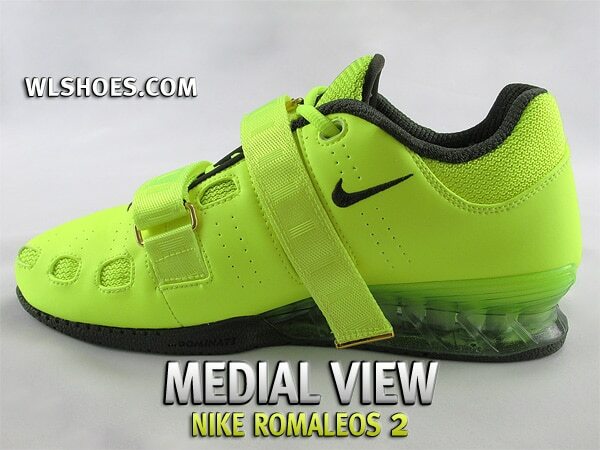 A size 9 men’s shoe tipped the scales at 17.1 ounces making the Romaleos the heaviest of the mainstream lifting shoes on the market right now. That’s not a good title to hold for a shoe that boast being “50 grams lighter than the previous model”. So again, I think Nike fell short in a category that needed a lot of improvement. My thoughts are that the whole “power bridge” design needs to be revisited or scrapped all together. If Risto can make a shoe with a solid wood heel that weighs less than your synthetic heel, you have a problem. Despite its flaws the shoe is still very well constructed. As such I would fully expect this shoe to last for years even under the most strenuous of training schedules. The design doesn’t appear to have any physical weaknesses and you shouldn’t experience any splitting heels or peeling soles (*cough* do-win *cough*). The Romaleos 2 sizing was true to size for me. If you have any other Nikes then you should base your size off that shoe, but keep in mind your lifting shoes SHOULD fit tight so if you wear your shoes lose you might want to go down a half a size. 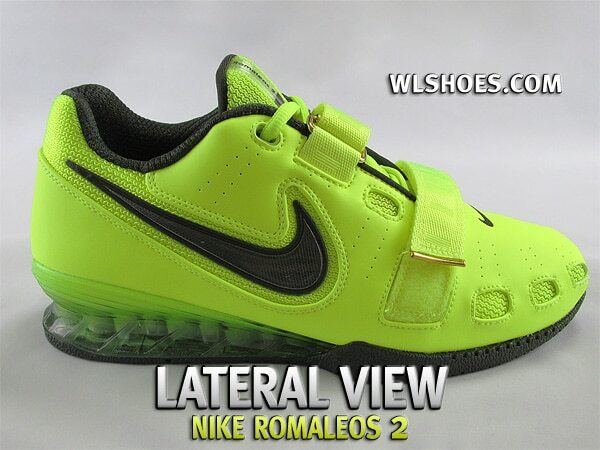 I often see people say that the Nike is the widest weightlifting shoe – this is not true. 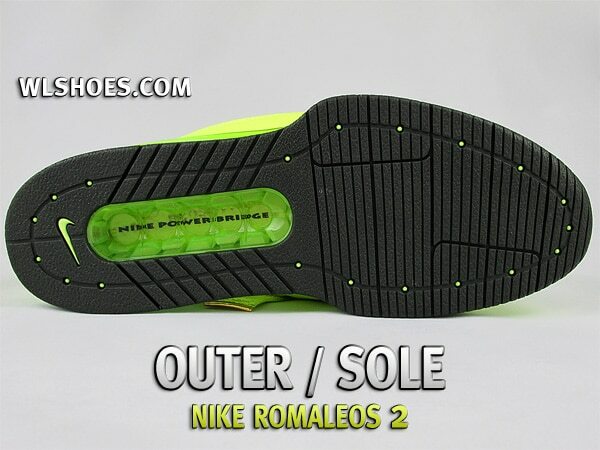 The width of the Romaleos measures 4″ at the widest part of the toebox on a size 9 shoe, not counting the superfluous “flaring” of the sole. This is the same width as several competing models including the Adidas Power Perfect2 and the Risto Olimpico. The AdiPowers are narrower at 3.75″ and the Reebok Crossfit Lifter is the widest at 4.25″. As I’ve already stated, I’m fairly disappointed in this model and I really wouldn’t recommend it due to some of the shortcomings I’ve already covered. If you have wide feet and you’re worried the AdiPower model is too narrow then I’d recommend the Olimpico made by Risto (if you can find it). Another alternative is the Power Perfect 2 which is suitable for your average lifter. If you don’t intend on using these for Olympic lifts and you don’t mind feeling like you are wearing space boots while in the gym, then this would be a fine pair of really expensive squat shoes. The only other reason to choose these would be because you just like the look of the shoe. (Insert Comment About How Styling Has NOTHING to Do With Lifting Weights Here). For some reason the Nike’s have always been a more difficult shoe to find. The only retailers that I know that consistently have the shoes in stock are going to be Rogue Fitness and Athleteps.com. I really didn’t like the new training insoles when I received my pair. It was too flat for my preference. Luckily, I was able to get a pair of the first generation training insoles and those gave the shoe a much better and fuller feel to them. I noticed my lifts became more comfortable as well. Unfortunately, those became compressed from all the lifting and they loss their thickness. The shoe’s no doubt well constructed but a few small changes would have improved it significantly. Ya, the competition insoles I received are made of a thick plastic measuring about 1/4 an inch. I don’t think they will ever compress but they weren’t very comfortable for me – way too much pressure under my arch and around my heel. Seems like the 2nd version isn’t going to help me any better than the first (the TPU midsole digging into my heel). I noticed that Pendlay is shipping their new 2013 models out and I’m hoping someone can do a review on those. They seem to have a better heel just from the pictures on their website. I would avoid the Pendlay shoe like the plague. Not only is it ugly, but Do-wins are very cheaply made. My recommendation is to go adidas or check out the new olimpico from risto – it’s a great shoe if you can find it in stock. I’ve heard others complain about the heel slip. What do you think this is caused by? I assumed they just purchased a size too big. I believe it is the shape of the heel cup – it is fairly wide fitting and doesn’t surround my heel as fully as other models. I guess it would fit fine if you have large heels but I have a narrow heel and a wide forefoot. Tried on my buddies romaleo 2’s he wears a size 10.5 sneaker but got his roms in size 10, I’m the same size, they were a little snug but not too uncomfortable, do you recommend them a little snug as opposed to a. Little loose? All lifting shoes should be tight… uncomfortably tight in a new shoe. Pat, i wear 8.5 on my adidas plift trainer (snug fit) and got a size 8 romaleos 2 and it was atleast 1cm too long. Size 8 measured at 26cm inside the shoe. I hope this info helps as adipower and adidas pl trainer sizes are the same. I absolutely love mine and I use them exclusively for olympic lifting and squats. My last pair of olympic lifting shoes were Pendlay’s and it’s a night and day difference. The Nike’s are MUCH more stable and solid (yes they are heavier), but I have not noticed a difference in my ability to move my feet quickly. I threw out the training soles, but the competition sole’s are great. I love how stiff this shoe is. I agree with the strap comment though. They will never cause any problems for me, but the excessive length does look a bit goofy. I’d like to try the Adipower’s as well, but can’t justify having two $200 pairs of weightlifting shoes. Go for them Jason! I have a pair and really am considering buying a 2nd pair (not because they wont last, they just are so great I dont want to end up having to look for them once the time comes. Cant imagine they will ever produce anthing better, haha). Never wore Romaleos, but adipowers are just great. They are very solid yet I dont feel uncomfortable moving around the gym (I do all the time), so for me its not even “just finish my training and take em off”, I could wear them all day and my feet are not fatigued or sore. Hi there! Great website and great reviews of all your shoes, the fact that you specifically buy each one individually and try them out goes to show how objectivity comes into play when you review the shoes. Hopefully you or anyone in the site can help me out. 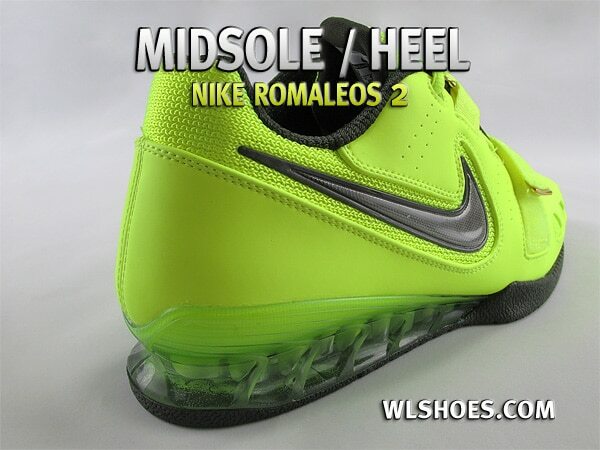 I want to invest in either the Romaleos 2 or the Adipowers. I’m quite leaning toward buying the Nike’s as it has been the brand I’ve used my entire life and have more confidence in their sizing and durability. Although this site has somewhat convinced me to give the Adipowers a second look and great consideration as well. My first question would be, is what everyone saying about going a half inch down on size really better for either shoe? My nike running shoes all are 10.5 with a little space in the toe area, it would be nice to be informed about this. Also how is the durability? Finally how does it break in? Does it end up expanding too much, or not at all? Hopefully anyone can help me out, I would really appreciate it. Thanks! I have about a year of oly lifting experience and many years experience powerlifting. I ordered both the adipowers and romaleos 2 to compare. Without question, I would choose the adipowers over the romaleos any day. When you compare them side by side, you can really see and feel the differences. I have a standard width to slightly wide foot. In the adipowers, my foot feels snug and incredibly stable. The well-designed strap and the heel cup really limit the lateral movement which is important for oly lifting. The construction of the shoe feels super solid. My only complaint would be that they only come in the red color, although it is an awesome color. I hear they’re coming out with white ones this summer that have similar styling to the 2008 adipowers. The romaleos felt like a gym shoe sewn to an olympic lifting heel. The upper material felt cheap and thin. I felt very wobbly wearing them – the lateral stability wasn’t good. It’s possibly that my foot just wasn’t wide enough to fill out the shoe. The straps also felt cheap and are ridiculously long and hang off the shoe when you tighten them up. It’s outrageous that Nike is charging the same price as adidas for these shoes. If your foot is wide, I suppose I could see the adipowers being uncomfortable but I would probably recommend the adidas power perfect 2’s over the romaleos. I believe the upper material has a little more flexibility for a wider foot while still offering the same quality adidas construction. Adidas has been making oly lifting shoes for decades so they know what they’re doing. Adipowers all the way! I know this is a late comment but I have a question. Someone posted that the heel slippage is normal. I bought a size 5 and I really don’t want to return the shoes for a 4.5, only because its such a hassle. Anyway, the shoe is tight around the toes, almost to the point that my toes go numb, is there a fix to the heel slippage? Bigger sock? I read a post about double looping the eyelet. Any thoughts or ideas? Thank you so much!